Kings of War - Alan and Rob had a couple of games using Kingdoms of Men and Forces of Nature, followed by a quick Saga game in a Final Stand scenario. FOGN - In a further playtest of the Quatre Bras scenario, Brett's Austrians successfully defended against Mike's French. FOGN - Al (British and Spanish) defeated Philip (Army of the Orient) in a 1000 point game. Saga - Alan and Rob had a couple of games using the new Crescent and Cross rules. FOGN - Mike used his new French army against Andrew's Prussians. Brett (French) beat Philip (German Confederation) in a test of the Quatre Bras scenario. Crossfire - Bruce and John had a game using Bruce's new 20mm WWII terrain with John's armies. FOW - Kit (Germans) played Steve (Soviets) in a battle over a railway terrian. The NSWC hosted our first Snapshot tournament. It was a one-day event using late war armies. The three scenarios were Free For All, No Retreat and Dust Up. Kit won first place. In addition to Snapshot, there were a few regular club games today. John and Grant had a 25mm DBR game, using Portuguese Colonial with Tupi allies agains Royalists. The Royalist infantry outshot their opponents, and even the Royalist merchant ships outshot the Portuguese warships. 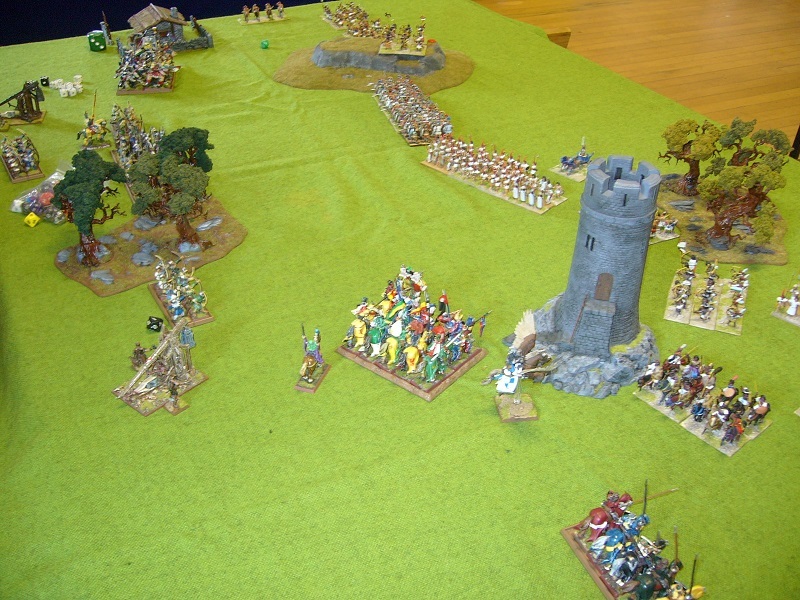 Alan and Philip had two Kings of War games, both using Kingdoms of Men. One game was drawn and Alan won the other. FOGN - Philip's German Confederation 1813 got a 30-10 win against Kendall's Russian Cavalry Corps 1813. FOW - Lee had two games, first against Steve and then Rob. Kit's US force got a 6-1 win against Steve's Germans in a fighting withdrawal scenario, playing on a boccage terrain that will be used at Snapshot next week. The mass of German conscripts await the advancing Russian cavalry and horse artillery. Not a Russian infantryman to be seen anywhere!. 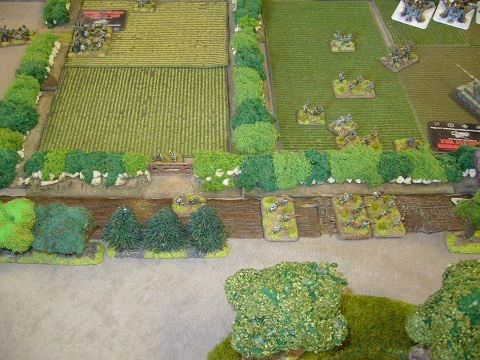 Germans and Americans clash in the bocage. Alan, Philip and Rob played in the Kings of War tournament, all three using Kingdoms of Men armies. Rob took out first place in the tournament. Some more practice games of Kings of War, preparing for the Clash of Kings tournament next weekend. Finally Rob played Alan, both using Kingdoms of Men. There were three Napoleonics games. Mike, playing in his first FOGN game at the club, beat Brett. 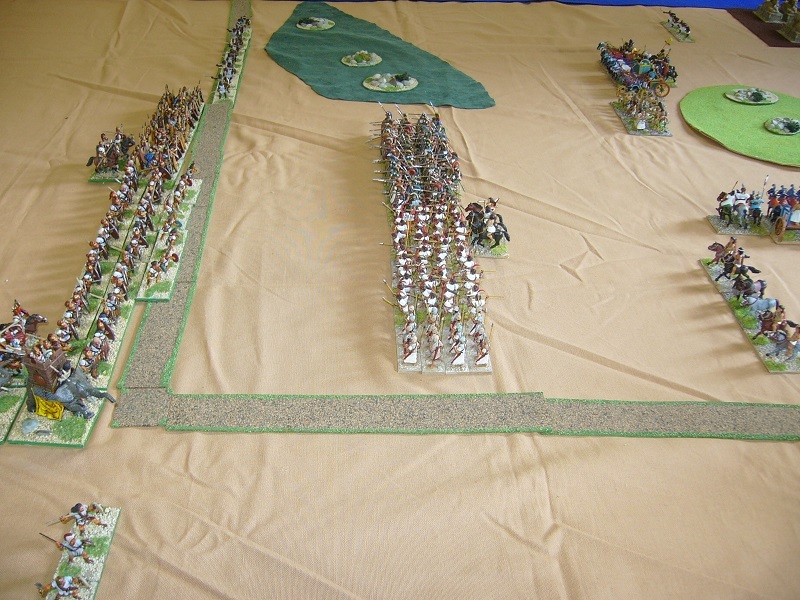 In the Salamanca scenario, Mike used 1809 French attacking and defeating Brett who had Austrians. Rob played Alan in a couple of games of Kings of War winning one a piece, both using Kingdom of Men. Brett played Mike in Napoleonics FOG. Kit (British) played Brent (Prussian) who fielded his very first unit for his new army, some very nice Hussars. Kendall provided moral support and troops for Brent. The Franklin Reivers club in Pukekohe hosted the second Heavymetalcon, this year with competitions for 25mm DBMM and WWII Bolt Action. DBMM 25mm - In a practice game for Heavy Metal Con, Benny's Carthaginians beat Philip's Saite Egyptians. FOGN - Marengo scenario game. Mike's Ottoman Turks beat Andrew's mixed nation corps. FOW - Steve's Soviets with lend-lease Shermans and captured Panthers got a 6-1 win over Brett's US army. The Ottoman Turks defending the towns and riverbank in the Marengo scenario. The same Greeks and Egyptians, recently seen masquerading as a Kings of War army, today were back to depicting themselves, but with no better result. The second day of the PoP tournament coincided with a regular club day. There were a couple of 15mm FOGN battles. Kit (British) beat Andrew (Mixed nationality corps) in the Durnstein scenario, illustrated below. In the other game, Brett played Brent assisted by chief-of-staff Gneisnau (Blue), defeating him after a tenacious hanging-on for longer than expected defence by the Prussians. The 11th annual DBR renaissance tournament is happening on the last weekend of September at the club hall. The theme for this year's Push of Pike tournament is Non-European armies 1494-1700. Tripolitanian infantry attacking Indian cavalry. A quiet meeting with Guard Con being on the same day. There were two games, FoGN and a 28mm WWII game. The City Guard are running GuardCon at James Cook High School (the venue for next year's Natcon), with several NSWC players in the Flames of War and Saga competitions. Kings of War. 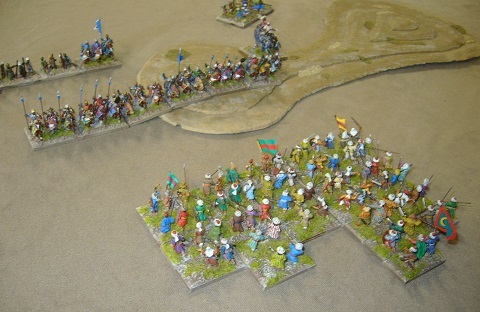 Alan and Philip had a fantasy battle using Warhammer Brettonians and DBMM Egyptians for Kingdoms of Men armies. Saga. Alan's Anglo-Danes played Rob's Vikings. A couple of games each of 15mm DBR, FOG-N, and FOW. In DBR, Rob and Kendall had a practice game for Push of Pike using Turkomen and Japanese, with the win going to Kendall. John (Later Danes 1672) played Stu (Royal French 1640). The 10-0 win to the Danes belied the closeness of the action. With two fast moving, hard-charging armies in play, the game was over in 2.5 hours. FOG-N. Al's Peninsular British beat Shaun's French. In a scenario game, Andy's Mixed Nation Corps, with a new British division, defeated Brett's Austrians in the Waterloo scenario. FoW. Mike had a couple of games using his Russian army first against Steve's Germans, and then Kit's US army. Alan and Kendall played a game of Songs of Blades and Heroes. 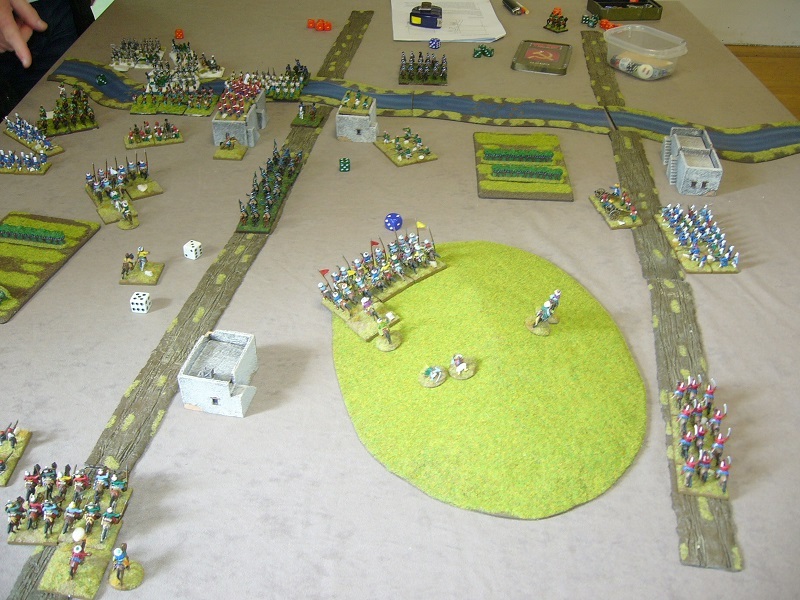 FOG-N. Today we had two Napoleonics games using scenarios from the Melbourne tournament. Andy's Mixed Nation Corps defeated Philip's Netherlands Corps in the Friedland scenario with an all-out assault on one of the towns. In the Durnstein scenario, Mike's 1814 French beat Brett's 1800 Austrians. FoW. Rob's British Airborne took on Steve's Germans. Rob and Alan had a couple of fantasy games, firstly Kings of War using Goblins and Human armies, and then Songs of Blades and Heroes. Flames of War. Steve had two games against Kit and Brett. The League of Ancients wargaming club hosted a Field of Glory Napoleonics tournament with 24 players, including seven from New Zealand - Al, Brett, Keith, Kendall, Kit, Mike, Philip. All the NZ players got top ten placings, including Brett 1st (Austrians), Kendall 2nd (Mixed Nation Corps) and Kit 3rd (British). As well as attending the competition, we also went on a shopping expedition to Eureka and bought a whole lot of AB Miniatures, and also got some stuff from the Wargames Miniatures trade stand where they were selling JR Miniatures terrain. 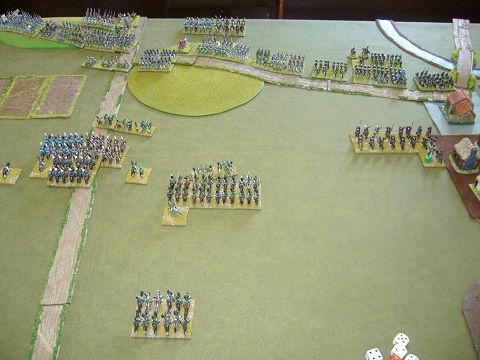 Three training games for the upcoming Napoleonics tournament.